– Theodor Fontane: Wanderungen durch die Mark Brandenburg. In the next campaign, which was not directed against Poland but against the former ally Sweden, opportunities for Christoph Albrecht von Quast arose again to achieve honors. Tied to Sweden by the Treaty of Labiau (1656), the Brandenburg Prince-elector felt compelled by raison d’état to abandon the alliance with Sweden – so as to not perish with the Swedes, or – what seemed to be more likely – for the Swedes. An anti-Swedish Five-powers-Coalition emerged consisting of Austria, Poland, Denmark, Holland and the Margraviate of Brandenburg, who fought against the Swedes in two theaters of war: in Prussia and Poland in the east, and in Pomerania and Holstein in the west. Albrecht Christoph von Quast waged war in the west. Between 1657 and 1659 the goal was to conquer Jylland (Jutland) and Fyn (Funen), the third largest island of Denmark. 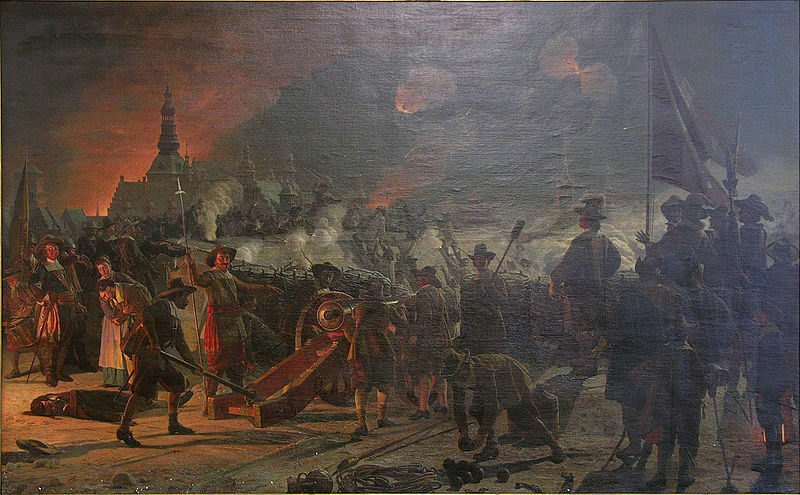 After a threefold failed attack in Jylland (Jutland) the Prince-elector relocated his troops to Pomerania in the spring of 1659, so as to prevent an invasion of the Margraviate of Brandenburg by Sweden. Four cavalry regiments and some infantry companies under the command of Albrecht Christoph von Quast remained in Jylland (Jutland) as part of the Brandenburg troops, whose general commander of the Five-powers-Coalition was the Royal Danish Field Marshal Ernst Albrecht von Eberstein (* 1605; † 9. Juni 1676), who was born a member of an aristocratic Frankish family in Gehofen, Thuringia. In order to prevent a further strengthening of the Swedish troops the Dutch dispatched Admiral Michiel Adrianszoon de Ruyter (* March 24, 1607; † April 29, 1676) to the Baltic Sea. In Kiel he took aboard a Danish-Dutch force under the command of Field Marshal Hans von Schack (* October 29, 1609; † February 27, 1676), an Earl of German nobility and Danish Imperial Councillor and military commander, to be disembarked in the north of the island of Fyn (Funen). Meanwhile, the army under Field Marshal von Eberstein was to carry out a next and fourth attack should on Jylland (Jutland) so as to overcome the Little Belt strait between the Danish island of and the Jylland (Jutland) Peninsula. Admiral de Ruyter was able to ship the troops of Field Marshal von Schack to the north of the island Fyn (Funen), where they landed at Kerteminde. Field Marshal von Eberstein successfully led his troops across the Little Belt to Middelfart. 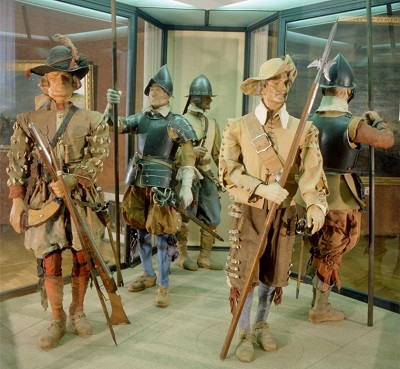 In Odense both Field Marshals united their troops to an army approximately 16,000 men strong against the Swedes under the command of the Count Palatine Philipp Florinus von Pfalz-Sulzbach (*January 20, 1630; † April 4, 1703), Count Palatine of the Pfalz and Imperial General Field Marshal. Hoping to be able to fight the approaching units individually, Count Palatine von Pfalz-Sulzbach took position in front of the fortress Nyborg. The terrain was well chosen as it offered enough natural obstacles. The right wing was commanded by the Count Palatine, in the middle stood the experienced general Stenhock with his troops (fourteen companies of infantry and five pieces of artillery), and the left wing, commanded by Lieutenant General Horn. 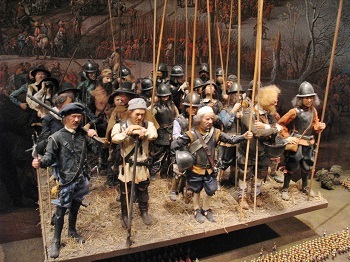 A model of a section of a pike and shot formation from the Thirty Years’ War on display at the Army Museum in Stockholm. and the center was covered by Field Marshal von Schack with Dutch infantry units under Group Captains Killegray, Alowa and Meteren. The second attack was carried out exclusively by Danish troops from the regiments of Trampe, Rantzau, Ahlefeldt, Brockhausen, and Güldenleu. The coalition troops – quite divided on their management level – were numerically far superior to the Swedish troops, yet the Swedish troops had more combat experience and a greater national unity. Danish defenders fire at the attackers, 11 February 1659. In the last battle the Swedish troops on the left wing faced the Brandenburg cavalry regiments of Quast, Kannenberg, Gröben and one Dragoon Regiment under the command of Field Marshal von Eberstein, which opened the battle, however, their attack was unsuccessful. The right wing under the command of von Quast, consisting of the imperial regiments “Matthias” and “Graf Caraffa”, the Danish regiment von der Natt and the Polish Brigade Przimsky were equally unsuccessful. The terrain selected by the Count Palatine now paid off for Sweden, the attacking cavalry regiments remained stuck in the bog and did not get forward. In this unfavorable moment in battle, on the side of the coalition troops, Albrecht Christoph von Quast advanced in person with a heavy infantry division of pikemen against the Swedish troops, and he led his troops successful to battle. Quast, injured by two bullets in his body and no longer capable of horse riding, on the shoulders of his attacking pikemen he had himself carried right through the Swedish left wing. This was sign enough for the troops of Field Marshal von Schack in the center to advance against the Swedes and the cavalry regiments under Field Marshal von Eberstein also now continued their attack successfully. The Swedes retreated hastily. The Count Palatine fled to Korsör in a fishing boat, in order to bring Swedish King Karl X. Gustav the news of the lost battle. Only Lieutenant General von Horn tried to hold the fort of Nyborg for one more day, before he and the rest of the Swedish Corps betook themselves into war captivity. The message of the defeat at Nyborg by the Count Palatine of Sulzbach is said to have shaken the Swedish king so much that he died in its aftermath. The death of King Karl X. Gustav was followed by the Treaty of Oliva and the pulling of coalition troops from the Kimbriske Halvø (Jutland Peninsula). The Brandenburg regiments were disbanded near Hamburg and the soldiers dismissed to their homes. 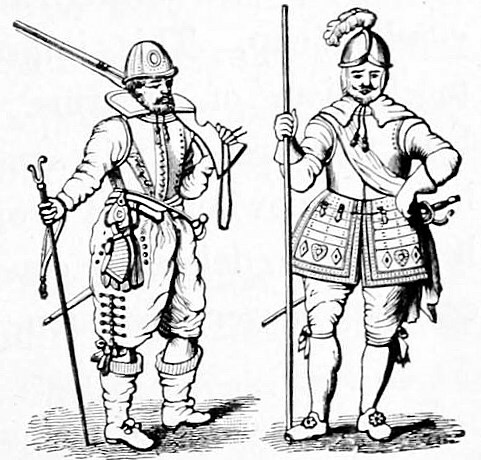 Musketeer and pikemen, early 17th century. From: Piercy, Willis Duff: Great Inventions and Discoveries, 1911. Albrecht Christoph von Quast remained in the service of the “Great Elector” of Brandenburg Friedrich Wilhelm, but returned to his manor in Garz. In 1667 he once more received order by the from the elector to form and establish a regiment and was appointed governor of the Spandau Citadel by the elector. Brockhaus’ Kleines Konversations-Lexikon, F. A. Brockhaus, Leipzig, 1906. Coat of Arms: photo by Germain Quast from the Dutch Antilles on the island of Curacao, March 23, 2015. Neues Preussisches Adels-Lexicon, oder genealogische and diplomatische Nachrichten von den in der preussischen Monarchie ansässigen oder zu derselben in Beziehung stehenden fürstlichen, gräflichen, frei-herrlichen and adeligen Häusern, mit der Angabe ihrer Abstammung, ihres Besitzthums, ihres Wappens and der aus ihnen hervorgegangenen Civil- and Militärpersonen, Helden, Gelehrten and Künstler; bearbeitet von einem Vereine von Gelehrten and Freunden der vaterländischen Geschichte unter dem Vorstande des Freiherrn L. v. Zedlitz-Neukirch. Vierter Band. P – Z. Leipzig, 1837. Gebrüder Reichenbach. Piercy, Willis Duff: Great Inventions an Discoveries, 1911. Quast, Sigismund von: Geschichte der Familie von Quast, Braunschweig 1974 (Nachträge 1980–1988). see: http://www.von-restorff.de/Ahnentafeln/Geneal_Info/groeben/groeben.htm#BM11316. Quast, Wilfried v.: Geschichte der Familie v. Quast, Manuskript 1974. see: http://www.von-restorff.de/Ahnentafeln/Geneal_Info/groeben/groeben.htm#BM11316. Theodor Fontane: Die Grafschaft Ruppin – Wanderungen durch die Mark Brandenburg. Wagner: Ars bella gerendi – Aus dem Soldatenleben im Dreissigjährigen Krieg. Artia, Prag 1980. Westphal, Lothar: Geschichte des Dorfes Protzen. 1905. 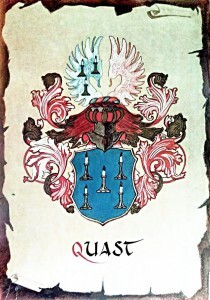 Coat of arms of the house of Quast. This entry was posted in Quast family history and tagged Albrecht Christoph von Quast, Andreas Quast, Brandenburg, genealogy, lineage, Theodor Fontane, Wanderungen durch die Mark Brandenburg. Bookmark the permalink.